Fifty miles south of San Francisco on the Pacific coast, 115-foot-tall Pigeon Point Lighthouse has been a beacon for those on the sea since 1872. 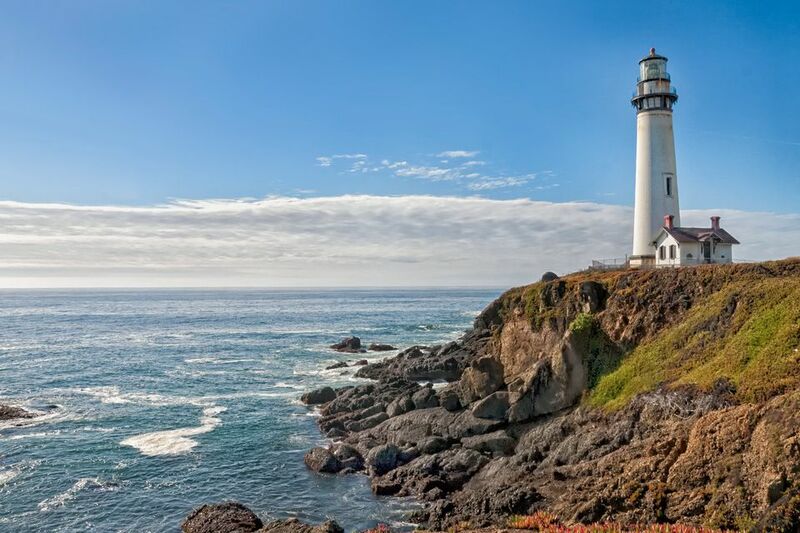 Resembling the twin Outer Banks of North Carolina lighthouses named Bodie and Currituck, Pigeon Point is California's most photographed lighthouse. It also ties with Point Arena for honors as the tallest lighthouse on the Pacific Coast. Pigeon Point's first-order Fresnel lens is still in place but is lighted only occasionally to commemorate the anniversary of its first light which occurred at sunset, November 15, 1872. The tower is still an active U.S. Coast Guard navigation aid but now uses an automated, 24-inch Aero Beacon. Because of structural instability, the inside of Pigeon Point Lighthouse is not open to the public, but you can take a virtual tour courtesy of California State Parks. Repair work began in 2011, and the re-assembled lens is on display in the fog signal building. The grounds are open, and you can see the lighthouse from the outside during daylight hours. Docents lead history walks around the grounds a few days a week. Check the schedule. You can also find some tidepools to explore at low tide near Pigeon Point. They about 100 yards north of the hostel building. You can also go bird watching. For many years, a the commemorative lighting was done on or around November 15. Hundreds of photographers gathered to take its picture. I was one of them several years ago. Unfortunately, by the time the light was turned on, it was too dark to get that striking image I had imagined. During repair work, this event has been put on hold, and you should check with the lighthouse before you try to go. The Pigeon Point Light was named for the clipper ship Carrier Pigeon, which sank off the point in 1853. The lantern room was built at the Lighthouse Service's New York depot and shipped around Cape Horn to California. After three more ships had been lost in the same area, Congress approved construction of a lighthouse at Pigeon Point, at a cost of $90,000 (which would be well over $2 million today). In contrast, the planned project to restore the lighthouse may cost $11 million or more. The Fresnel lens is a first order lens, the largest size made. It is almost 8 feet tall and weighs one ton. it was used at the old Cape Hatteras Lighthouse in North Carolina until the Civil War ended. Pigeon Point's identifying lighting pattern was one flash every ten seconds. In 2000, the Lighthouse Inn was under construction next to the lighthouse when the Peninsula Open Space Trust bought the property. They promptly tore it down it to retain a more natural state. The old Pigeon Point keepers' housing is now a hostel run by Hostelling International. Pigeon Point Lighthouse is located on CA Hwy 1, 50 miles south of San Francisco, between Santa Cruz and Half Moon Bay.